Artist Sheila Karrow balances three labels for herself: artist, environmentalist and Christian. As a resident of Waterloo, Ont., Karrow – a teacher, mother and artist who began to produce art professionally in 1996 and has shown her work locally and across Canada – looked around her own locale and became fascinated by the way human interaction with nature has changed the landscape. One of her collections traces the perceptions of landscape, land and nature through the transition in Southern Ontario from virgin forest growth, to cleared land for agriculture, and then to developed land for residential and urban purposes. 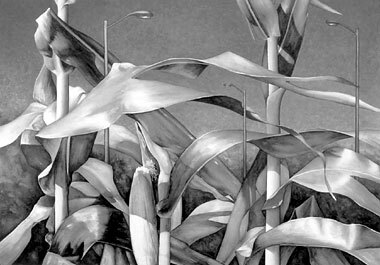 Her work sometimes becomes her instructor, she says, pointing at the piece titled “Encroachment.” The painting depicts a cornfield with streetlights amidst stalks and tassels. After it was completed she saw it as a piece showing the harmony between farming and the land, but also the tension of urban development or sprawl upon farmland. “You can’t go into the past and bring the trees back,” she says. Karrow’s art reminds us that God is working in nature, mourning its destruction and longing for its redemption as well. She finds that it is often the pastoral elements in her pictures that reflect Christ’s presence. Christians have a key role to play in advocating for the value of the natural world. As individuals we can make choices that are less harmful to the environment. “Our changing landscape has a timeless voice reminding people of the rhythms in the soil, plants and animals,” she says. “Sometimes I paint positive images of trees or farm fields. Other works depict the increasing fragility of our land.” Karrow’s art gives a dual message that there is beauty and life to be seen in the world around us but it shouldn’t be taken for granted. Christians above all others have a mandate for good stewardship of the earth. In fact, without our efforts for preservation, we may be left with little that can be moved by God’s breath, the wind. Lynn Graham attends Kitchener MB Church.